They could be nuns. Those could be habits. But they're burkas. What is that supposedly ancient Chinese curse? "May you live in interesting times"? The proverb may be of dubious origin, but it captures the fate of Marjane, the heroine of "Persepolis," in a Persian nutshell. The precocious Iranian girl is born during the reign of the Shah (Mohammad Reza Shah Pahlavi), witnesses his overthrow during the Islamic Revolution, becomes enamored of pop music and punk rock (and Bruce Lee) as powerfully disruptive and liberating political forces, and experiences a new world of sexuality and materialism in Europe. "Persepolis," based on the autobio-graphic novels by Marjane Satrapi and co-written and co-directed by Satrapi and Vincent Paronnaud, is absolutely enchanting -- a history lesson, a fairy tale, and a girl's-eye-view of growing up. It's a movie that makes you feel glad to be alive. I wasn't familiar with Satrapi's work, but from what I've seen since, the (mostly black-and-white animation renders her style beautifully: a mix of charming, early Hanna-Barbera coloring-book simplicity, and more atmospheric watercolors or charcoals that suggest a '60s and '70s European sensibility. The delicately modulated tones of "Persepolis" are similarly sophisticated. It veers from hilarious to poignant, sweet to terrifying, abstract to concrete, personal to political, cynical to rhapsodic... and back again. 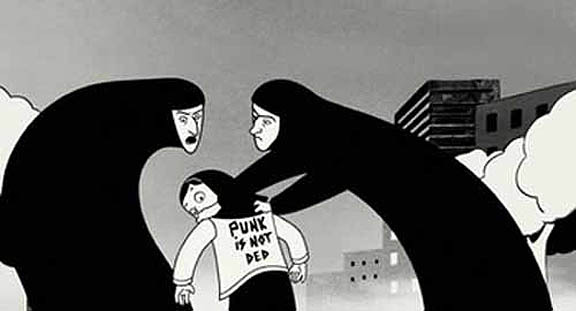 "Persepolis" streams by in no time, yet manages to convey the sense of an entire childhood into early adulthood. Upon getting back to my room I immediately ordered the books, "Persepolis" and "Persepolis 2."